Certainly life in Russia today is better than it has been for years. The stores are stocked with goods. The once worthless ruble is a genuine currency, strengthening against the dollar these days. Crime persists, but the cities are not as rough as in previous years. And then there are the President's loudest and most visible defenders: members of Nashi (Ours, in Russian), the cultish pro-Putin youth movement. In mid-December, about 20,000 of the Nashi faithful from all over Russia gathered for a rally by the Kremlin walls to celebrate the recent victory of Putin's United Russia Party in elections to the parliament. From the stage, speakers, rock singers and rappers declared their patriotism and love for the President. A banner read, into the future with putin! Someone introduced Dasha, a 10-year-old member of Mishki (Bear Cubs), the new children's division of Nashi. "I love Russia," said Dasha. "I love teddy bears. I love Putin. Together we will win!" I went to Nashi's Moscow headquarters a few days later and met with Lyubov Serikova, a pretty 22-year-old redhead from Russia's Chuvash Republic who is a rising star in the organization. She was thrilled with the recent election and credited Nashi with helping thwart an unnamed enemy's attempt to launch an "orange revolution" in Russia. Her world seemed conspiratorial, and she echoed Putin's own statements: those who run against the President were trying to bring the country down. Putin, she said, "has made Russia a leading country in just a few years." When we finish talking, I take a look at an official Nashi poster hanging outside her office, which excoriates U.S. policies. It's reminiscent of Soviet-era propaganda with its non sequitur acceleration of hysteria: "Tomorrow there will be war in Iran. The day after tomorrow Russia will be governed externally!" But this is no fringe group. Putin frequently visits Nashi's training camps and meets with its leaders. And from there he sometimes launches anti-Western tirades, including a recent blast at London authorities who are demanding the extradition of the suspected killer of Litvinenko. Putin's mission is not to win over the West. It is to restore to Russians a sense of their nation's greatness, something they have not known for years. This is not idle dreaming. When historians talk about Putin's place in Russian history, they draw parallels with Stalin or the Tsars. Putin, one can't stress enough, is not a Stalin. There are no mass purges in Russia today, no broad climate of terror. But Putin is reconstituting a strong state, and anyone who stands in his way will pay for it. 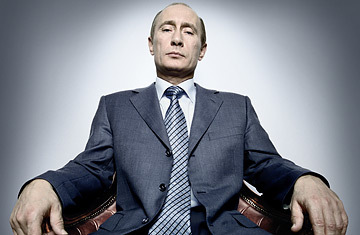 "Putin has returned to the mechanism of one-man rule," says Talbott of the Brookings Institution. "Yet it's a new kind of state, with elements that are contemporary and elements from the past." And there's plenty that could go wrong. The depth of corruption, the pockets of militant unrest, the ever present vulnerability of the economy to swings in commodity pricesall this threatens to unravel the gains that have been made. But Putin has played his own hand well. As Prime Minister, he is set to see out the rest of the drama of Russia's re-emergence. And almost no one in Russia is in a position to stop him. If he succeeds, Russia will become a political competitor to the U.S. and to rising nations like China and India. It will be one of the great powers of the new world. Back at the dacha, with snow falling lightly outside, our dinner and discussion continue. Putin has been irritable throughout, a grudging host. Suddenly, at 10 o'clock, he stands and abruptly ends the evening. "We've finished eating, there's nothing more on the table, so let's call it a day," he declares. Actually, the main course (choice of sturgeon or veal) and dessert ("bird's milk" cake)lovingly printed in gold ink on the prepared menu cardshaven't yet been served. The Russian President's brusqueness is jarring. Have our questions angered him? Bored him? Does he have another appointment? It's not clear. "Bye bye," says Putinin Englishas he walks briskly out of the room. The work of rebuilding Russia, apparently, is never done.